Lakeview Outdoor Patio Furniture and Fire Pit Tables are now up to 60% off. Free shipping offer on select items. Don't miss out! Borrowing traditional cues from outdoor classics, the Villa Flora Collection by Lakeview Outdoor Designs offers elegance and meticulous artistry to any space. The flawlessly crafted cast aluminum frames are powder coated in a Java finish and sealed with a clear coat to protect the furniture and ensure longevity. Deep red Canvas Henna Sunbrella fabric encases the 2 1/2 inch thick cushions to provide water, mold and fade resistant seating. The detailed scrollwork and intricate weaving of the 4 person, 48-inch table top combine with a scrolling design on the chair backs to create a graceful and delicate presence. For added shade, the table can accommodate a 1 3/4 inch diameter umbrella. Enliven your outdoor space with the traditional charm of the Villa Flora Collection. Adjustable leveling feet allow ideal placement, providing improved stability on uneven outdoor surfaces. Dimensions (in inches): Dining Table: 48 W X 48 D X 29 H. Swivel Rocker Dining Chair: 24 13/16 W X 24 13/16 D X 35 13/16 H. Seat Height: 16 1/2 Inches. Arm Height: 25 Inches. Included assembly hardware is made with stainless steel components for outdoor use. 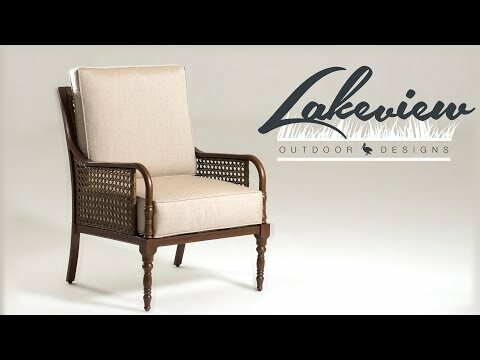 Lakeview Outdoor Designs warrants that the entire furniture assortment is free from defects in material and workmanship from purchase date for one year. Defects or damage resulting from acts of God, accident, neglect, premeditated or unintentional damage, climate, or arbitrary use will not be covered. Lakeview Outdoor Designs will issue a replacement part free of charge to purchaser only if the part is considered defective within warranty provisions. For warranty consideration, proof of purchase must be included as well as photography of defects. The Villa Flora Collection can be best described as casually elegant. The graceful curves of the cast aluminum chairs blend beautifully with the patterned tables. The design of the Villa Flora collection has Victorian roots and will add drama and flair to any outdoor area. This collection offers the largest variety of seating and tables available from Lakeview Outdoor Designs. A number of dining options are available with this collection, including bistro sets for 2 or seating for up to 8 around the substantial 60 X 60 inch square dining table. The entire collection features a rich Java finish on the aluminum body that enhances the deep tone of the Sunbrella Canvas Henna cushions. These cushions are sure to contribute the perfect amount of color to your area. The dining chair cushions are a generous 2 ½ inches thick and fading isn’t a worry because the fabric is 100% solution-dyed acrylic and are fade resistant. All chairs are made from rust-resistant cast aluminum and sealed with a protective clear coat finish to guarantee longevity of your furniture. Counter height and bar height stools are also available and can be purchased separately or with one of the 42-inch round tables as a set. The bar stools feature a plastic covering on the foot rest to protect the finish from scuffs and scratches. Dining tables for this collection include a 30-inch bistro, 48-inch round, 60-inch square, and 72 X 42 inch oval. This collection also features accessories such as a serving cart and 30-inch round Lazy Susan. Just as with the dining sets, there are a number of options available in Villa Flora seating. In addition to the club chairs, loveseat, and sofa, there is also a two-person glider. All of the deep seating options include a 4½-inch thick seat cushion and plush back cushion covered in Sunbrella Canvas Henna fabric, providing ultimate comfort. For those who like to recline and relax, the 5-position chaise lounge will quickly become your favorite spot. Tables include a 21-inch square side table and 42 X 26 inch coffee table. Two fire pit options are offered for those who live in areas with chilly nights or simply love enjoying the warmth of a fire. The wood burning fire pit includes a spark screen and ash bucket and doubles as a grill with included cooking grates. The propane fire pit is easy to use and has a 55,000 BTU output. If you intend on seating more than 8 people, this may not be the collection for you. 16 1/2" 16" 16 1/8" 16 1/2"
48 X 48" 60 X 60" 84 X 42" 84 X 42"
25" 25" 24 13/16" 25 1/2"